Final update of the week! Have a great weekend everyone! Over night we added two new landing pages on Rewards Canada that help bring together more of our site in our efforts to make to site easier to navigate and find all our articles! The two new pages are table of contents pages for our Earning Stories and Redemption Stories series of articles. You can access these pages from the links to the left or via the main navigation menu on Rewards Canada under the 'Learn' tab. 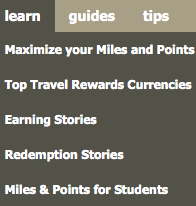 Perfect timing for our ever growing features and news for students (see our Student's Guide to Points & Miles) as Air Canada has launched Air Canada Altitude Students. Now before you get too excited it isn't anything like the actual Air Canada Altitude Elite program but more so a discount program for students. The program is free to join if you are a Canadian post-secondary student and offers discounts such as 1 hour of free Wi-fi on board Air Canada planes that are Wi-fi enabled, a one time 10 to 15% discount on an Air Canada ticket, and discounts with Air Canada vacations. Chances are other promotions will come down the line as the program grows and learns what these students are craving. Find out more about the new Air Canada Altitude Student program here. Vote for your favourite travel rewards credit card! Over 6,000 poeple have voted and would love to hear from you if you haven't voted yet. Vote here!